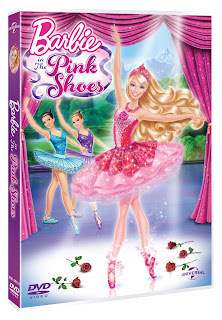 Barbie And The Pink Shoes, is the latest Barbie movie and available to buy from March 18th 2013. We were sent a preview copy, which meant that not only am I the best mother in the world (according to Top Ender) but that by the time it's available to buy on Blu-Ray or DVD that I will have watched it roughly 60 times. The story is Barbie as a character called Kristyn, a talented ballerina who wants to join a dance troupe and to be like the dance troupes lead dancer but every performance of hers is lacking in that special je ne sais quoi, much to her disappointment. Then Kristyn finds a pair of pink ballet shoes that take her and her best friend Hailey on a magical adventure to a land ruled by the Snow Queen where the different classical stories you'd expect to see performed as a Ballet are lived out as real life and in each story Barbie/Kristyn takes on the main female role and feels the dance coursing through her. The girls work out that they need to defeat the Snow Queen, as she is actually evil and that if they manage to defeat her they will be able to return home and perform in the big performance. Of course they do manage to defeat her, but I'm not going to tell you how, and they make it back just in time. Kristyn with her newfound confidence performs again and dances both the dances from Giselle and from Swan Lake and adds in her own personal touches which wows the ballet company and Kristyn/Barbie is able to see that when you dance from your heart it shows in your performance. Top Ender loved the film and has watched it almost every single day since we got the review disc. I don't mind her having done this, as the film includes the classic music from the shows and it has given her a new appreciation of classical music. Top Ender has never wanted to be a Prima Ballerina, but she has been using the DVD as inspiration for dances that she has been making up and I think that little girls and boys who do want to be part of a Ballet company when they are older will love watching the film. We were sent a preview copy of the DVD to review.